The Israeli army Sunday admitted that its fighter jet F-16, which crashed near the Jezreel valley, was hit by a Syrian anti-aircraft missile. The F-16 was downed in response to an Israeli raid, targeting Iranian military entrenchments in the civil war-torn country. The army spokesperson confirmed that the fighter jet was hit by shrapnel in the Syrian airspace on Saturday during a sortie, Times of Israel reports. “Even if it was just hit by fragments, that’s still because of the missile,” the spokesperson said. The army also stressed that Israeli jets met a massive barrage of Syrian anti-aircraft fire, which reportedly included at least four different types of Russian-made air defense systems, specifically the SA-5, SA-17, SA-6 and SA-3. 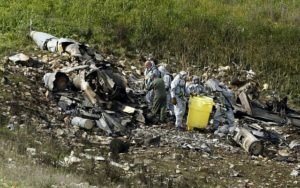 The airmen in the F-16 reportedly bailed out of the plane which crashed near the Jezreel Valley in northern Israel. The pilot according to reports sustained severe injuries while the second was lightly wounded. Israel Saturday launched a raid in Syria against alleged Iranian targets after the Jewish state accused Iran for sending a drone into Israel. Israel has been sounding the alarm over what it calls Iran’s increasing involvement in Syria where the Islamic Republic has been backing the embattled regime of President Bashar al-Assad. Tel Aviv fears that Iran is establishing military positions from where it and its Lebanon-based ally Hezbollah could be staging attacks against Israel. Iran and the Syrian regime have denied the presence of an Iranian drone into Israel. Posted by KanelkaTagba on Feb 12 2018. Filed under Headlines, World News. You can follow any responses to this entry through the RSS 2.0. Both comments and pings are currently closed.